We did indeed have our annual Thanksgiving outing to The Happiest Place On Earth. There was no repeat of The Great Pumpkin Pie Incident of 2006 as there wasn't a single slice to be found in all of Disneyland. I tracked down some pumpkin muffins, but that's just not the same. Marshmallows, caramel, orange candy coating, chocolate stripes. On a stick. YUM! I ate about three-quarters of this and suddenly felt like Tigger! I got such a sugar rush that my head was spinning and I just wanted to bounce around. Hoo Hoo Hoo HOO!!! 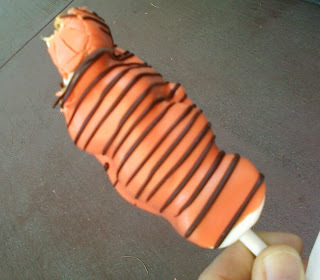 "Excuse me," said the cast member working the counter, "don't you mean TIGGER Tail?" Me: "Oops! I'm sorry! Yes! TIGGER Tail! Am I going to get kicked out of Disneyland?" C.M. : "Well, no, but I don't think Tigger would be very happy to hear you say that." Me: "I think you're right. I'm sorry." That's cute. Do they have them at Disney World too? I have to get one next time I'm there. Nicole--I haven't been to Disney World since I graduated high school in 1988, so I have no idea!!! Cosette, I Love You Very Much!